Keep up the good fight, Robert. I find a combination of absolutely resolute, constant focus works well for transforming bureaucratic practices. Once the bureaucrats know it's easier to do their job than put up with you, they will mend their ways... Until they're rid of you. Publicity also helps a lot. Hold your head high - You're doing a ton of very good things. I'm looking forward to following your very worthwhile blog. I a impressed by this unusual, but superlative act of citizenship in trying to address the city's parking meter problems. I mowed the lawn of the man who invented the parking meter, a Professor Theusen (sp)of Oklahoma State University. The first one was installed in Oklahoma City. These things in Baltimore are not parking meters. I think of them as a parking time "slots". Some times, U don't win at all---U stay even---occasionally you lose, and very seldom do you hit the jack pot, winning a lot of extra time. 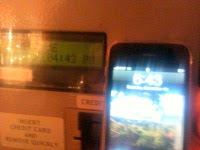 The meter maid needs to be replaced, or augumented, by young, roving Geeks! The "house" (city) beats U. A mini-class action law suit may be in order! Rob - good for you. It is tough sometimes to get government agencies or businesses to "do their jobs" and fix problems. It's especially upsetting after you have politely pointed out the problem several times only to have your complaint not acted upon. I am reminded of Uncle Remus's Brer Rabbit and the Tar Baby. Brer Rabbit just kept punching away at the tar baby trying to get a response -- all he got was stuck in the mess. But don't let that stop you! It's a noble calling!